National Traffic Safety Committee has reported that the country saw 124 traffic accidents killing 67 and injuring 74 during three days of New Year holiday 2018. 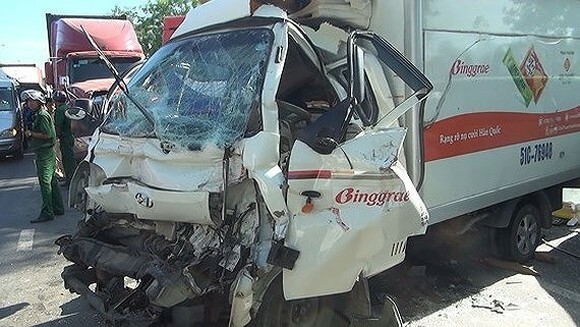 The death toll reduced 12 people compared to the same period in 2017 but the number of traffic accidents was up 33 percent and injured people up 37 percent. Authorized agencies issued decisions to penalize 16,324 cases breaking traffic law with the total fine off VND11.1 billion (US$490,000), seized 2,434 vehicles and revoked 518 driving licenses. The committee’s hotline received and handled tens of calls and SMS messages informing traffic jam at some approach roads to bus and railway stations and airports, unreasonable ticket price hike and overloading. Mr. Khuat Viet Hung, deputy chairman of the committee, said that traffic condition was quite stable during the holiday without serious accident relating to passenger buses or long lasting traffic jam. But unreasonable fare increase and overloading still occurred in some routes. On the first and last day of the holiday, bus stations, many ring roads and entrance gateways to Hanoi and HCMC were overloaded, especially at Tan Son Nhat International Airport.